Over the years I've been on Facebook, I regularly see this copyright message on my newsfeed posted by my friends who are scared of their content being misused. The message claims to protect all the media like status messages, photos, videos, and comments that users make on Facebook. The message has started making the rounds on the social network once again. The message says that once a user posts or shares the status update, their rights to their media will be protected, and they can sue Facebook or those who use their content.. While this sounds very good and legal, it is fake and a hoax. While those who share it stand to lose or gain nothing, it shows how gullible they can be, and may be used by scammers who target people based on social engineering. The hoax doesn't even have its facts right. A quick Google search will also show that there's is no such thing as the Berner Convention. Maybe the originator meant to write the Berne convention, which is an international agreement protecting literary and artistic works. "Facebook users cannot retroactively negate any of the privacy or copyright terms they agreed to when they signed up for their Facebook accounts nor can they unilaterally alter or contradict terms instituted by Facebook simply by posting a contrary legal notice on their Facebook walls." 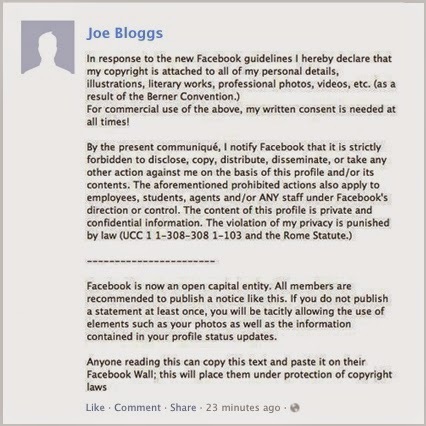 So where exactly do you stand on copyrights of stuff you post on Facebook? These are the important aspects below. Read the full legalese here. - For content that is covered by intellectual property rights, like photos and videos (IP content), you specifically give us the following permission, subject to your privacy and application settings: you grant us a non-exclusive, transferable, sub-licensable, royalty-free, worldwide license to use any IP content that you post on or in connection with Facebook (IP License). This IP License ends when you delete your IP content or your account unless your content has been shared with others, and they have not deleted it. - When you delete IP content, it is deleted in a manner similar to emptying the recycle bin on a computer. However, you understand that removed content may persist in backup copies for a reasonable period of time (but will not be available to others). - When you publish content or information using the Public setting, it means that you are allowing everyone, including people off of Facebook, to access and use that information, and to associate it with you (i.e., your name and profile picture). It is this public setting that allows bloggers like me to see and post or embed your messages, pictures, etc. Want to be more private? Check your privacy settings by clicking on the lock icon in the upper-right corner of your profile. Also, you can make each individual post accessible to only friends, or the person you post to their wall.